Always a heavy silver coin weighing around one ounce, during the 19th and 20th centuries the crown declined from being a real means of exchange to being a coin rarely spent and minted for commemorative purposes only. In that format it has continued to be minted, even following decimalisation of the British currency in 1971. However, as the result of inflation the value of the coin was revised upwards in 1990 to five pounds. The coin's origins lay in the English silver crown, one of many silver coins that appeared in various countries from the 16th century onwards, the most famous example perhaps being the famous Spanish pieces of eight, all of which were of a similar size and weight (approx 38mm diameter and containing approx 25 grams of fine silver) and thus interchangeable in international trade. The kingdom of England also minted gold Crowns in the 16th and 17th centuries. The dies for all gold and silver coins of Queen Anne and King George I were engraved by John Croker, a migrant originally from Dresden in the Duchy of Saxony. The British crown was always a large coin, and from the 19th century it did not circulate well. However, crowns were usually struck in a new monarch's coronation year, true of each monarch since King George IV up until the present monarch in 1953, with the single exception of King George V.
The Queen Victoria "Gothic" crown of 1847 (with a mintage of just 8,000 and produced to celebrate the Gothic revival) is considered by many to be the most beautiful British coin ever minted. The King George V "wreath" crowns struck from 1927 through 1936 (excluding 1935 when the more common "rocking horse" crown was minted to commemorate the King's Silver Jubilee) depict a wreath on the reverse of the coin and were struck in very low numbers. Generally struck late in the year and intended to be purchased as Christmas gifts, they did not circulate well, with the rarest of all dates, 1934 (mintage just 932), now fetching several thousand pounds each. The 1927 "wreath" crowns were struck as proofs only (15,030 minted). With its large size, many of the later coins were primarily commemoratives. The 1951 issue was for the Festival of Britain, and was only struck in proof condition. The 1953 crown was issued to celebrate the Coronation of Queen Elizabeth II, while the 1960 issue (which carried the same reverse design as the previous crown in 1953) commemorated the British Exhibition in New York. The 1965 issue carried the image of Winston Churchill on the reverse, the first time a non-monarch or commoner was ever placed on a British coin, and marked his death. According to the Standard Catalogue of coins, 19,640,000 of this coin were minted, a very high number at the time, making them of little value today except as a mark of respect for the national war leader. Production of the Churchill Crown began on 11 October 1965, and stopped in the summer of 1966. The crown was worth five shillings (a shilling being 12 pre-decimal pence) until decimalisation in February 1971. The last five shilling piece was minted in 1965. The crown coin was nicknamed the dollar, but is not to be confused with the British trade dollar that circulated in the Orient. In 2014, a new world record price was achieved for a milled silver crown. The coin was issued as a pattern by engraver Thomas Simon in 1663 and nicknamed the "Reddite Crown". This was presented to Charles II as the new crown piece but was ultimately rejected in favour of the Roettiers Brothers' design. Auctioneers Spink & Son of London sold the coin on 27 March 2014 for £396,000 including commission. Further issues continue to be minted to the present day, initially with a value of twenty-five pence, and then, from 1990, with a value of five pounds. The legal tender value of the crown remained as five shillings from 1544 to 1965. However, for most of this period there was no denominational designation or "face value" mark of value displayed on the coin. From 1927 to 1939, the word "CROWN" appears, and from 1951 to 1960 this was changed to "FIVE SHILLINGS". After decimalisation in 1971, the face value kept its five shillings equivalent at 25 new pence, later simply 25 pence, although the face value is not shown on any of these issues. 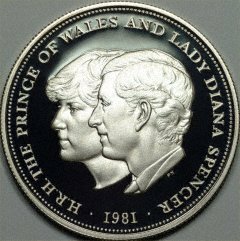 From 1990, the crown was re-tariffed at five pounds (£5), probably in view of its relatively large size compared with its face value, and taking into consideration its production costs, and the Royal Mint's profits on sales of commemorative coins. While this change was understandable, it has brought with it a slight confusion, and the popular misbelief that all crowns have a five-pound face value, including the pre-1990 ones. Although all "normal" issues since 1951 have been composed of cupro-nickel, special proof versions have been produced for sale to collectors, and as gift items, in silver, gold, and occasionally platinum. The fact that gold £5 crowns are now produced means that there are two different strains of five pound gold coins, namely crowns and what are now termed "quintuple sovereigns" for want of a more concise term. Numismatically, the term "crown-sized" is used generically to describe large silver or cupro-nickel coins of about 40 mm in diameter. Most Commonwealth countries still issue crown-sized coins for sale to collectors. New Zealand's original fifty-cent pieces, and Australia's previously round but now dodecagonal fifty-cent piece, although valued at five shillings in predecimal accounting, are all smaller than the standard silver crown pieces issued by those countries (and the UK). They were in fact similarly sized to the predecimal half crown (worth two shillings and sixpence). For silver crowns, the grade of silver adhered to the long-standing standard (established in the 12th century by Henry II) – the Sterling Silver standard of 92.5% silver and 7.5% copper. This was a harder-wearing alloy, yet it was still a rather high grade of silver. It went some way towards discouraging the practice of "clipping", though this practice was further discouraged and largely eliminated with the introduction of the milled edge seen on coins today. 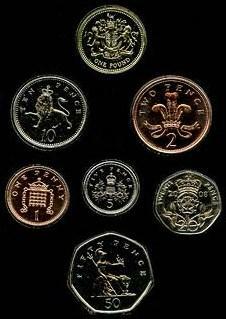 In a debasement process which took effect in 1920, the silver content of all British coins was reduced from 92.5% to 50%, with a portion of the remainder consisting of manganese, which caused the coins to tarnish to a very dark colour after they had been in circulation for a significant period. Silver was eliminated altogether in 1947, with the move to a composition of cupro-nickel – except for proof issues, which returned to the pre-1920 92.5% silver composition. Since standardisation of the UK's silver coinage in 1816 (UK Coinage Reform 1816), a crown has, as a general rule, had a diameter of 38.61 mm (1.52"), and weighed 28.276g (1 oz). ^ a b "The Royal Mint: Five Pound Coin Designs and Specifications". The Royal Mint. Retrieved 10 July 2015. ^ "Spink sets new world record for an English silver coin, 27 March 2014". Spink Auctioneers. Archived from the original on 2 April 2014. Retrieved 27 March 2014. ^ "Quintuple Sovereigns - Five Pound Gold Coins". taxfreegold.co.uk. Retrieved 2017-06-23. ^ "British Gold Proof Commemorative Crowns". taxfreegold.co.uk. Retrieved 2017-06-23. Wikimedia Commons has media related to Crown (British coin). The shilling is a unit of currency formerly used in Austria, the United Kingdom, Australia, New Zealand, United States and other British Commonwealth countries. Currently the shilling is used as a currency in four east African countries: Kenya, Tanzania, Uganda and Somalia. It is also the proposed currency that the east African community plans to introduce . The word shilling comes from old English "Scilling", a monetary term meaning twentieth of a pound, and from the Proto-Germanic root skiljaną meaning 'to separate, split, divide.' The word "Scilling" is mentioned in the earliest recorded Germanic law codes, those of Æthelberht of Kent. The rupee is the currency of Sri Lanka, divided into 100 cents. It is issued by the Central Bank of Sri Lanka. The abbreviation is generally Rs., but "LKR" is occasionally used to distinguish it from other currencies also called rupee. The half crown was a denomination of British money, equivalent to two shillings and sixpence, or one-eighth of a pound. The half crown was first issued in 1549, in the reign of Edward VI. No half crowns were issued in the reign of Mary, but from the reign of Elizabeth I half crowns were issued in every reign except Edward VIII, until the coins were discontinued in 1967.